MAY 2007 -- May! I’m almost afraid to say it will be warm and sunny by the time you get this. As I write this, it is April, but it feels like late February or early March. Hopefully spring has finally come and we can all get outside and work in the soil. While you’re at it, think about the Grange and what it means to you. Then in the evening sit back, look at what you’ve accomplished outside and put your thoughts on paper. 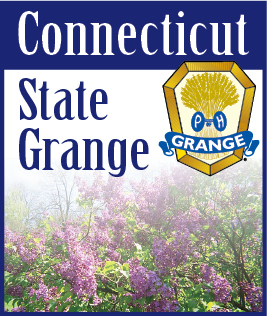 A new contest this year – “THE GRANGE IS…” In 50 words or less tell us what the Grange is. Entries will be judged with winners announced at State Session. The deadline is October 1st. The winning entry will be read on Thursday night and during the year I will use some of the best ones in my column. Then, the next time someone asks you what the Grange is, you will have an answer ready for them. I already have a few entries in, but you still have plenty of time to get yours to me. I am also happy to report that “A WORD FROM HOME” has been well received. Several Lecturers have reported sending letters as well as packages to our service men and women. I received a letter from Brett A. Meyer, LtCol, USAF from Balad Air Base, Iraq, thanking us for our support. He distributes all the letters and packages he receives to the troops who do not receive mail from home. This is a great project. Thank you and please keep up the good work. Full information on the project including how to get names and addresses if you don’t know of any from your area is in the Blue Book. See you around the State….